Governor-elect Ned Lamont and Lieutenant Governor-elect Susan Bysiewicz celebrate their victory following Election Day on Nov. 7, 2018. "A few moments ago, I called Ned Lamont to concede the race for governor and congratulate him on a hard-fought victory," Stefanowski said in an emailed statement. "I wish both Ned and the state of Connecticut success over these next four years." Stefanowski first broke news of his concession on WPLR-FM. "When Bridgeport came in that was a surprise," he said. "Bridgeport was a much bigger number in his favor than we thought." Unofficial numbers from the secretary of the state's office have Lamont up by more than 15,000 votes in Brideport, with all of that city's precincts reporting. Lamont won by more than 38,000 votes statewide. Late Tuesday night, it appeared the eventual outcome would be complicated by contested ballots that the GOP sought to have ruled invalid. Wednesday morning, Stefanowski said he was dropping that challenge. "We'll let that go," Stefanowski said. "Ned's won this thing fair and square." Same-day voter registration proved problematic in at least two Connecticut municipalities. In New Haven, hundreds of people, many of them Yale University students, waited hours in New Haven City Hall to register to vote. Connecticut Election Day Registration law requires people to be registered and in the system before the polls closed at 8:00 p.m. in order to vote. With many people still not registered close to the deadline, attorneys from the secretary of the state's office stepped in, and swore in the new voters en masse, before the deadline, allowing them to cast a ballot. 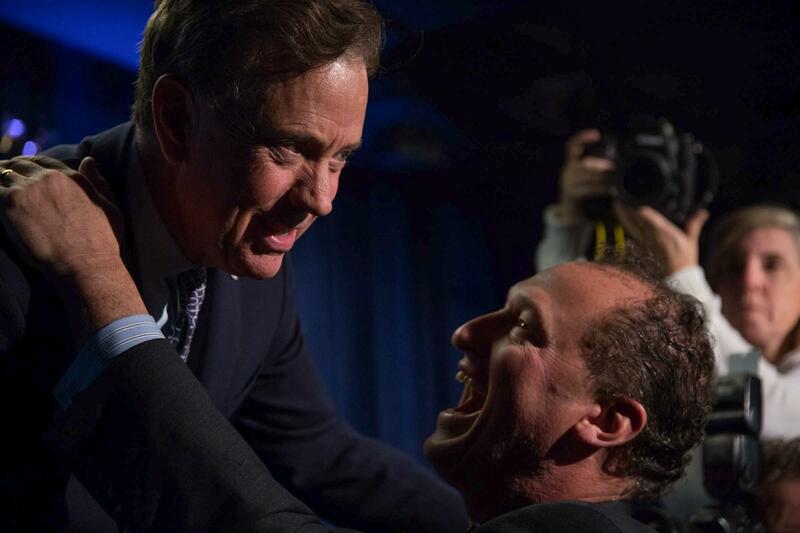 Governor-elect Ned Lamont embraces Jay Moran, mayor of Manchester at a celebration the day following Election Day. That prompted the Stefanowski campaign to accuse the secretary of the state's office of circumventing state law in New Haven and in Mansfield, where there were also issues. The GOP sought an injunction in Hartford Superior court, requesting the registrar of voters separate Election Day registration votes in New Haven. According to the Hartford Courant, Superior court judge Cesar Noble has ordered that several hundred of those ballots be set aside for possible review. The judge would have held a hearing Friday on the fate of those votes. It was a contentious race from the beginning. Lamont had to distance himself from incumbent Dannel Malloy, who is by some measures the most unpopular governor in the nation. Malloy chose not to run again after two terms in charge. 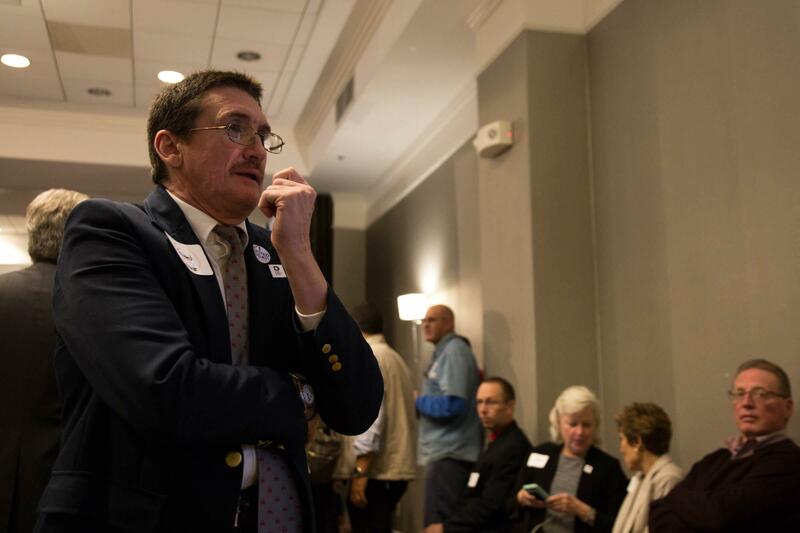 He’s been dogged by fiscal problems, as he seeks to solve Connecticut’s decades-long refusal to fund its public pension obligations. The polls going into Tuesday’s vote showed a close race. Although Lamont had a statistical advantage in most estimates, he was within the margin of error. One poll from Sacred Heart University showed Stefanowski four points ahead just days before voting. Some pundits had speculated early on that minority voters, essential to a Democratic win, may have been turned off by Lamont’s embrace of establishment Democrat Susan Bysiewicz as his running mate. Newcomer Eva Bermudez Zimmerman, who is of Puerto Rican heritage, had made a strong challenge for the lieutenant governor slot, but was defeated at the convention. Ed Ames waits for the final results to come in at the Stefanowski HQ. He said he was confident at the end of the night that Stefanowski would be the next governor. Stefanowski, who was a surprise win in a crowded Republican primary, appeared to have made headway against the anticipated “blue wave” of opposition to GOP candidates. The former business executive has never held elected office, and had not voted in several previous elections. He also had not lived in Connecticut for most of the last decade. Stefanowski ran an unconventional campaign, mostly shunning press coverage. Instead he spent early and heavily on television advertising, seeking to tie his opponent to the unpopular Malloy. This post has been updated with new election results. Democrats made their first state legislative gains in 10 years Tuesday night, breaking an 18-18 tie in the Senate by picking up three Republican seats and defending vulnerable Democratic lawmakers who were targeted by the GOP. Democrat Jahana Hayes, an educator who rose from poverty and teen motherhood to become a National Teacher of the Year, made her own history Tuesday night as the first black woman elected to Congress from the state of Connecticut. Democratic U.S. Sen. Chris Murphy coasted to re-election Tuesday as record numbers of voters went to the polls in a historic midterm election that will determine which party controls the next Congress.